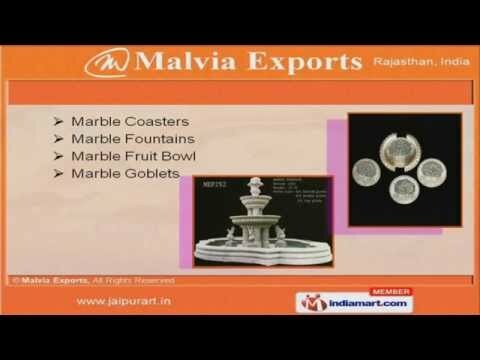 Welcome to Malvia ExportsManufacturer & Exporter of Marble HandicraftThe company was established in 2001 at Jaipur. Our client centric approach helped us to gain marketacross Europe, America & Middle East. We are well known in the market for our competitive prices, capacious warehousing, innovative design& timeliness, Our product list includes premium grade Marble Ashtrays, Boxes, Candle Holders & Clocks. We offer Marble Coasters, Fountains, Fruit Bowl & Goblets at industry leading prices. Marble Lanterns, Mobile Stands, Paintings & Pedestals are some of our best selling products. Our Marble Photo Frames, Pots, Statues & Tables are a class apart. Along with that we offer Marble Pottery, Temples, Pen Stand & Lamps at industry leading prices. We also provide Marble Vases, Oil Paintings, Marble Trays & Handicrafts that are widely acclaimed inthe market.